Ask a digital marketing analyst, he or she will say that nothing is more efficient to get smart returns on your online marketing efforts than improving your landing pages. Today, landing pages are the go-to-resource for strategic content marketing campaigns. It is obvious that most us know what landing pages denote, if not, let us recapitulate - it is the single page where we direct the web traffic to prompt out a series of actions. By definition, you need to focus on a singular page and get a desirable response pointing out to a meaningful call-to-action button. Landing page success does not focus on your actual goal at large, what drives it is a meaningful/snacky content. A content that will convey the right message to your customer about the brand/product/services you promote. 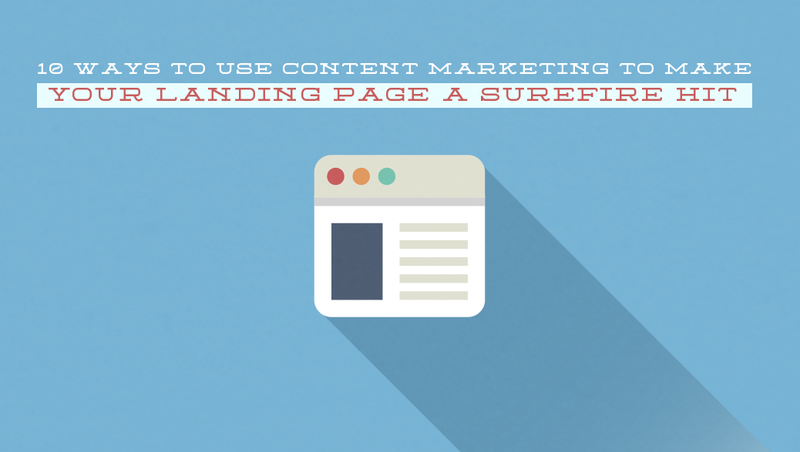 Let us put together a compelling list of ways to improve the landing pages with the use of content marketing. Here, are a bunch of ten tips that are easy to implement, and will help to improve the web results of your business blogs/websites. Landing pages must focus on convincing your visitors to perform a particular action. So make sure your call-to-action is clear, obvious and dictates the next actionable step to your visitor arriving at the landing page. Say it loud and clear – "Subscribe," "Sign Up," "Download," or "Purchase," well they are a little out of fashion today. Some updated landing pages now call up and say, "Don’t Miss Out on our Best Practices," “Catch us up at the event of XYZ”, etc. When you get down to write content for the landing page, make sure it resonates perfect solution to the stakeholders. It must address the pains and challenges of your clients, so that it compels them to click on the navigation button. Landing page contents must be specific and should not give your visitor too much of options. As too many choices make them confused and drive away their focus from specific actions, which you want your clients to take. You might have two great headlines, but one is more effective than the other one. On which headline will you like to stick? Here, using a simple A/B test will help you to determine which headline will be the best for your landing page. A/B testing helps to segment the traffic and optimize everything about your webpage until you find the desirable response rate. Belonging to a particular niche demands your business to target specific stakeholders or must represent your product in a targeted demography. In that case, you must segment the visitor and use one landing page per group focusing on a single message. One of the key points that contents must consider while dealing with the landing pages is - ‘time.’ You must consider the sales cycles, the season, peak hours or may be the client’s needs to promote your landing pages and get more conversions. The timing of your landing page promotion and relative message can make a great difference between success and failure. Make sure your body copy is free or error and grammatical slips. Take your time to reevaluate your syntaxes. If your landing page asks the customer to invest money on some product/services, but your website comes with an array of spell or grammar errors, will they trust you any longer? Ignoring the spell-check of your body copy, will risk your conversion rate. Images and videos bring a huge change in the conversion rate of your landing pages, if they directly relate to your body copy. Videos have amplified the conversion rate by 80% and strengthened your messages before the visitor. You can have some great screenshots of your product in action or short videos of the value-proposition of the products to get more number of clicks. However, it is more effective if you directly relate them to the text. Try this now. Landing pages must convey or giveaway free or exclusive offers that you might like to share with your new or existing customers. Hoist such incentives on the landing pages to get more conversion, which will finally turn to prospective leads. Use messages like “try before you buy” or “try out the demo,” etc. are some standard messages. Visitors turning up at your landing page are not going to read the contents like a newspaper. They do not read contents online rather they scan it. Use bullets, subheads to deliver a snacky/consumable content to your visitors. How to Optimize a Landing Page - infographic by quicksprout. These ideas are not less. If you start working upon them from today itself and reevaluate the website performance, you will find a huge change. Conversion rates are going to shoot up high if your landing page contents are fresh, unique, and influencing. William Walker lives in Birmingham, Alabama and works as a telesales executive after majoring in Economics. He jams up the best with startups working on products, growth, mobile, online business and brand equity. He enjoys writing informative blogs with good coffee or wine to inspire the wannabe market leaders.